We strive to meet enrollment goals across four competing yet complementary areas: academic quality, affordability, diversity, and international presence. 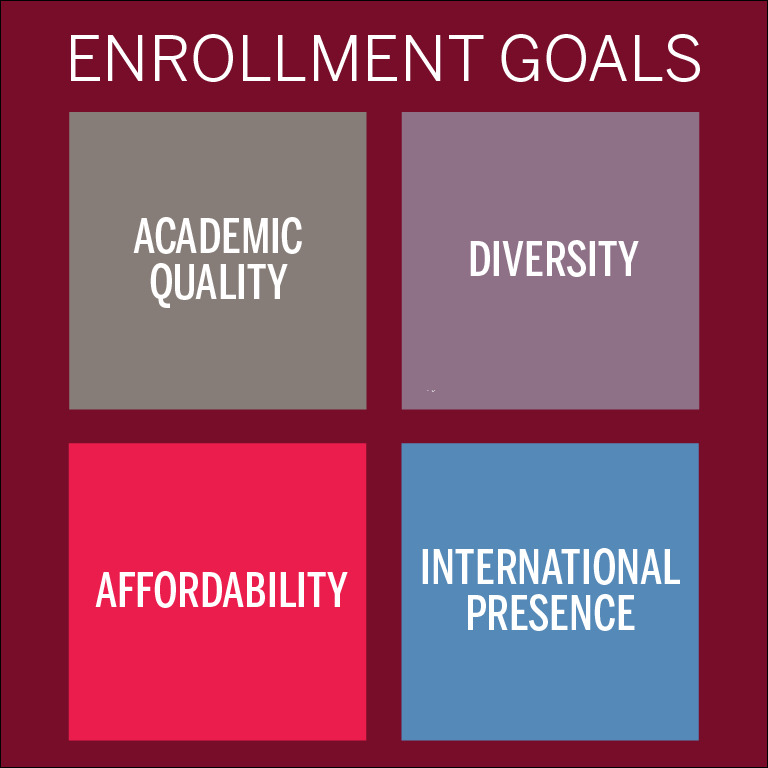 By focusing on these priorities, we help promising students from all backgrounds access an IU education. Read our strategic plan below to learn more about our goals for enrolling and supporting talented, deserving students from Indiana, the nation, and the world. To see recent successes, visit our annual OEM Overview. The OEM Bicentennial Strategic Plan offers strategies in line with those outlined in the IU Bloomington Bicentennial Strategic Plan, which in turn aligns with the university-wide plan. We view this plan as the cornerstone of future growth and innovation, and we are dedicated to implementing these initiatives. Exploring, evaluating, and implementing third-party prospect and application platforms to be where the students are and to streamline the application process for high school students. Developing a strong, collaborative and innovative K-12 outreach to promote pre-college engagement and the recruitment of prospective students. Devising, enhancing, and implementing comprehensive transfer recruitment and application processing strategies to increase enrollment of qualified transfer students (Hoosier Link, non-traditional, military, and intercampus transfers). Maximizing our Six C’s outreach in order to increase the proportion of underrepresented students in our undergraduate programs. Implementing local and vended technology that is most appropriate to the advancement of our recruitment, marketing, and processing needs. Implementing a comprehensive marketing strategy that promotes and celebrates the university’s accomplishments and promotes the IU brand. Expanding and enhancing programming opportunities offered to students throughout their first year by solidifying partnerships with various campus offices and the Bloomington community to promote student exploration, engagement, leadership, and success. Introducing innovation, increasing quantity, and enhancing quality of communications to underrepresented prospective students and families, including digital advertising, website content, and email and print marketing. Increasing the enrollment impact of the campus visit experience for more than 50,000 prospective students by reimagining the strategic visit plan to leverage a new, state-of-the-art visitor welcome space. Improving and refining strategic admissions communications for students through new CRM technology, which allows us to celebrate the diverse experiences, interests, and goals of prospective students considering Indiana University Bloomington and more efficiently manage student communication, events, and other work within one comprehensive tool. Providing a strategic enrollment management framework for the schools and the College and establishing principles of excellence through the coordination of a standardized, best practices approach to standard and direct admission, award strategy, student services, and the student experience. Expanding upon successful access and diversity recruitment initiatives for Indiana residents, both traditional and non-traditional, by introducing and implementing an enhanced strategic recruitment and award strategy for transfer students, as well as refining services and support for transfer students in their transition to the Bloomington campus. Supporting and facilitating the successful creation and implementation of a Bicentennial Scholarship Program. Redesigning the Pell Promise program to provide full tuition for all Pell Promise participants. Offering the four-year Pathway Scholarships to students who will follow one of the pathways routes to graduate credentials at IU Bloomington and who received Achievement Scholarships as a beginner at IU Bloomington. Providing and promoting fundamental financial literacy educational opportunities, with particular emphasis during the student’s first year. Supporting and providing feedback for a need-based grant program to reduce the financial debt burden of our low-middle income families who do not qualify for or receive enough federal or state grant funding to cover the cost of tuition. Creating a new institutional loan program to provide funding to students from low-middle income families or from families who have experienced an unexpected hardship. The new loan will serve as the replacement for the expiring Federal Perkins loan program. Striving for full representation from all Indiana counties by developing a highly collaborative and comprehensive recruitment and award strategy for low-enrolling counties, specifically through collaborating with internal and external partners such as the College Board, expanding the Bicentennial Scholarship, and leveraging third-party partners such as the micro-scholarship program Raise.me. Implementing new programming and recognition for the 21st Century Scholars, Lilly Scholars, MacDonald Scholars, and Snell Scholars to strengthen retention, social engagement, and future philanthropy efforts. Working with campus partners to improve the clarity of financial information across the six websites that contain major portions of financial content at IU Bloomington. Developing and deploying a fully integrated Scholarship and Financial Aid brochure. Redesigning the Student Central website to provide students and families the necessary resources for making sound academic and financial decisions in support of student success and affordability. Improving and expanding self-service technology and tools (such as SmartSource services) made available to students and families in order to shorten response time and ease of use. Collaborating with the Office of International Services and others on the free passport initiative. Providing free passports to students will have to be accounted for as a financial aid resource. Identifying and implementing additional methods to deliver important financial information to students and parents leading to improved financial preparedness for students at the start of each semester. Designing and implementing an extended orientation and first-year student engagement program throughout the entire first year. Enhancing international and multicultural education programs for first-year students. Expanding arts and humanities opportunities for first-year students. Implementing newly designed orientation and first-year transitional programs for transfer students that positively impact their academic, personal, and social needs. Supporting the development and display of curricular and co-curricular learning activities by enabling the recording, validity, and display of appropriate experiential/engaged learning activities on the student record and adding them to the student transcript. Adjusting registration and enrollment processes for beginning students (including international students) to place them into courses and experiences that best match the requirements for their academic objectives. Enabling students to obtain a certified electronic diploma so they may access their diploma much more quickly and making it available in multiple modalities for students to display and/or share. Displaying and communicating academic experiential learning activities to more fully represent the student academic experience at Indiana University. Completing the development of the Transcript Cover Page enabling students to highlight specific components of their academic record to the intended recipient, while ensuring that the highlighted items are drawn from the official IU documents and credentials. Enabling the display of the dissertation title and link to the dissertation on the transcript to enrich the transcript on behalf of the student for the intended recipient. Identifying space to provide a welcoming and hospitable area for prospective and current students and their families that appropriately reflects the stature of Indiana University, and continuing to reevaluate and reconfigure current space to meet future needs. Collaborating with appropriate campus partners in the expansion of IUB’s offering of one-stop services for the benefit of the students. Ensuring the integrity and accountability in OEM operations as shared services practices are fully adopted by the campus and the University Administration. Completing renovation of Ernie Pyle Hall (Admissions presentation/tours) and 1514 E. 3rd Street (Admissions administrative building) as suitable spaces to provide a welcoming and hospitable area for prospective and current students and their families that appropriately reflects the stature of Indiana University. Streamlining administrative and fiscal/financial functions to obtain organizational efficiency when possible while maintaining effectiveness, sustainability, and compliance with federal, state, and institutional policies. Working with Student Central partner offices, including the Bursar, Registrar, and the Office of Student Financial Assistance, to find more effective and efficient processes and deliver the highest level of student services possible. Establishing standard benchmarks, best practices, and reporting models to bolster and assess current and potential services and efforts. Supporting effective student communication and organizational decision making by leading the strategy and implementation of two new constituent relationship management (CRM) and communications tools: Slate, for the recruitment of students (segmented messaging and territory management), and Salesforce, for current students and staff (student services and staff management). Developing and implementing innovative marketing strategies—including augmented reality, paid digital, and retargeted advertisement—to create awareness, change attitudes, and impact actions with prospective and current students.